A lot of the time you hear about someone looking ‘totally unrecognisable’ and at the end of the day, they just look slightly different. They’ve had an inch of hair taken off, or gained an extra centimetre of flab, lost a few pounds, or got a very slightly more defined bicep. But this. This is legit. Zayn Malik looks unrecognisable. Zayn Malik looks like a totally different person. Now I guess to me, Malik would look unrecognisable anyhow. I’m not a fan of One Direction, or Zayn Malik’s solo work, and if I passed him walking into Greggs as I was walking out, I’d merely hold the door for him and hope that he’d say thanks. There he is. Zayn Malik circa 2014 or something like that? The Zayn Malik who burst onto our television screens before he started taking moody black and white Instagram photos. Woah. Hello shaved head. Hello cranium tattoo. Hello Zayn Malik. He looks less boy band and more like he’s got a cult following on SoundCloud, along with a new mixtape out called ‘Bath Salts and City’. Oh, and Gigi Hadid’s there too – another one who I wouldn’t recognise in Greggs. According to TMZ, some of the bigger news here, besides the complete transformation of Zayn’s head, is he’s back with Gigi Hadid – or at least that’s what you’d take from him and her pictured, getting pretty intimate together in New York City yesterday, (April 29). As for the future, whatever’s meant to be will always be. 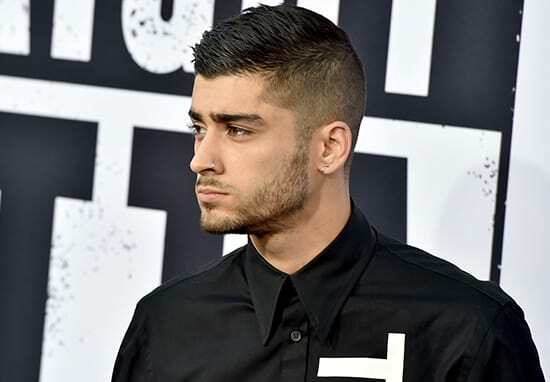 The former One Direction star and supermodel called it quits on their relationship last month amid recent rumours they were engaged. Apparently the duo were regarded as one of the most famous couples in the world, reportedly worth a whopping £45 million together. If they visited Greggs together they could get a helluva lot of sausage, bean, and cheese melts! This is definitely the end for now, but this isn’t a bitter split and they both have respect for each other. It’s a mutual decision so no one has completely ruled out a reunion in the future, but for now that’s not where their heads are at. Who would’ve thought they’d be back together after just a month apart? The couple started dating in November 2015, three months after Zayn broke off his engagement to Little Mix star, Perrie Edwards. Gigi had split up with US pop singer Joe Jonas only weeks before the pair got together. Zayn was introduced to the model at a Victoria’s Secret party, asking her out on a date during their first meeting. BACK ON AND MAKING OUT IN PUBLIC!! !